Corona Borealis, the Northern Crown, is a lovely semicircle of stars centered in the picture and opening to the left. 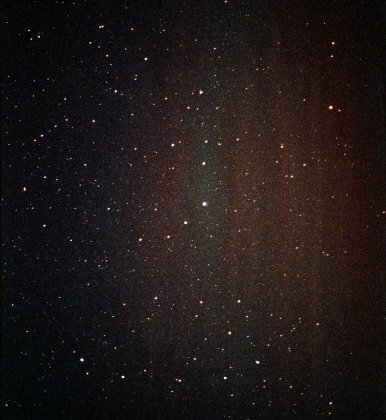 Alphecca (Alpha CrB), or Gemma, is the bright star at the Crown's center directly in the middle of the picture. Curving up and to the left are Nusakan (Beta) and Theta, while down and to the left are Gamma, Delta, and Epsilon (with Iota up and to the left of Epsilon). The strange carbon star R Coronae Borealis, which occasionally disappears from naked eye view after covering itself in carbon soot, is to the left and just slightly down from Alphecca. Nu (Nu-1 and Nu-2) is at far left center; Sigma is just up and to the right of Nu. Alpha and Beta CrB point directly upward to Eta. Zeta-1 and Zeta-2 combine to make the brightest star up and to the left of Theta, while Tau is the brightest star of the string up and to the right of Nu. Bootes is at the top of the picture, Serpens Caput at the lower right, Hercules at lower left. The close pair at upper left is Nu-2 and 1 Boo, Nu-2 on the left. 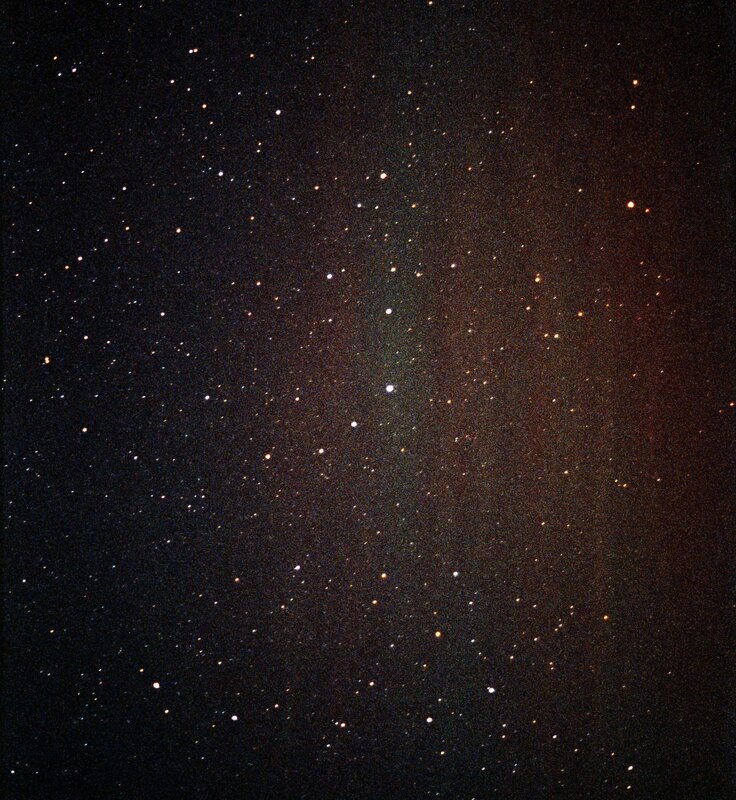 The faint vertical red and green bands in the background are from a weak northern lights display. North is toward the upper left. See Corona Borealis from Flamsteed's Atlas Coelestis Edition of 1781. Corona Borealis has two stars with orbiting planets: Kappa CrB and Rho CrB. For more on Corona Borealis, see The Royal Sky at Stellar Stories.